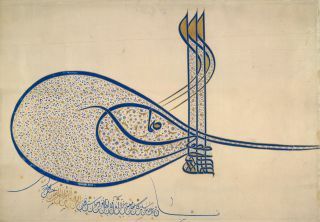 Written in pen and illuminated in gouache, this is the tughra (imperial monogram) of Suleyman the Magnificent (r. AH 926–73 / AD 1520–66). Tughras were used on documents, or firmans (commands) which were issued by the Diwan (Council of State). This example bears the Sultan’s name, Suleyman Shah, and that of his father, Selim, and the phrase ‘the one who is always victorious’. Within the widest loop, formed by the Han (Title), is an intricate illuminated design. Painted in black and gold are fine floral spirals set against a ground of minute cloud-scrolls. The inner loop is filled with split-palmette scrolls and florets. Further floral- and cloud-scrolls fill the space between the ascending parts of the letters. The spiral design is also found on underglaze painted ceramics. The practice of illuminating the tughra was established by the ruler Bayazid II (d. AH 917/ AD 1512), under Suleyman they became ever more elaborate. The subject of the document to which this tughra was attached is not known. This copy of the tughra, or imperial monogram, of Süleyman the Magnificent is written in black pen. Contained within the curves and lines of the letters are delicate illuminated designs of floral spirals in black and gold. 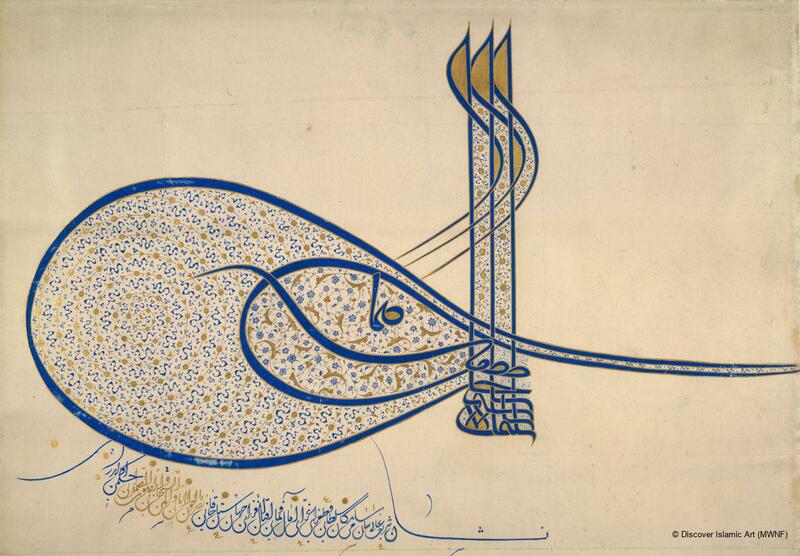 This is the tughra of Suleyman the Magnificent (r. 926–73 / 1520–66). Due to the type of illumination employed this particular example probably dates to about 956 / 1550. Donated by E. Beghian in 1949. The tughra would have been inscribed and illuminated at the imperial court of Suleyman the Magnificent in Istanbul, Turkey. Porter, V., Mightier than the Sword – Arabic Script: Beauty and Meaning, Malaysia, exhibition catalogue, 2004, pp.190–1, cat. no. 92. Rogers, J. M., Islamic Art and Design 1500–1700, London, 1993, pp.45–6, cat. no. 32.